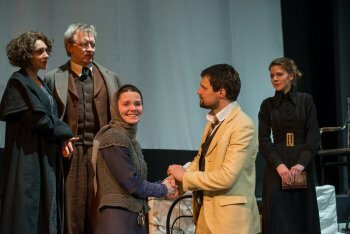 The Maly Drama Theatre’s production of Anton Chekhov’s last play, The Cherry Orchard, though exasperating, is also entertaining and, to a small degree, revelatory. The director, Lev Dodin, imposed way too many of his own ideas on the delicate structure of Chekhov’s portrait of early 20th century Russia, in the process making questionable choices. The focus too often strays from Chekhov and his darkly comic portrait of a Russia to a piece of silly business or a maladroit placement of rows of audience members, breaking the fourth wall. He has the working class upstart Lopakhin sing “My Way,” the Frank Sinatra classic, to celebrate his buying the cherry orchard—a jarringly farcical bit. The actors race up and down the aisles of the BAM Harvey Theater, speak directly to the audience too many times, and generally turn the show into the kind of immersive event that ruins the mood. The several rows of spectators placed throughout the charmingly decaying set (designed by Aleksander Borovsky) cause the actors to walk about the furniture gingerly, in particular when handling billiard cues. Chekhov is, perhaps, the fourth wall specialist playwright, whose portraits of Russia’s changing society should be viewed as if over hearing special secrets and observing ever-changing emotional torment. Dodin uses the conceit of a silent movie to impart the image of the cherry orchard which is soon to be bulldozed in the name of progress. This is actually lovely, and the one idea that works, particularly when, at the end, Ranevskaya craves a memento of her cherished cherry orchard and Lopakhin offers her the reels of film which she hugs to her breast as she makes her final exit. 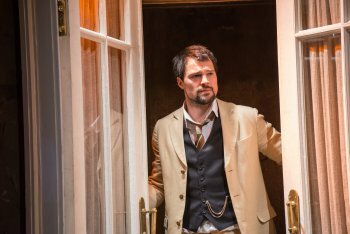 Another good decision was the casting of Danila Kozlovskiy as the upstart Lopakhin, the merchant and family friend who winds up buying the cherry orchard. Usually played as slightly oafish and uncouth, Mr. Kozlovskiy, handsome, lithe and charismatic gives an energetic star turn that almost unbalances the play. Certainly, the rest of the cast were up there with Mr. Kozlovskiy, if not as filled with fireworks. An almost too young looking Ksenia Rappaport portrayed Lyubov Ranevskaya, the property owner as a beautiful, if clueless, woman. There is a line that claims that her daughter, Anya (a rich voiced, passionate Danna Abyzova) looks like her twin sister and this was almost too true here. As her adopted daughter, Varya, who tragically misses out on marrying Lopakhin, Elizabeta Boiarskaia combines inner and outer beauty. Ranevskaya’s brother, Leonid, was played by Igor Chernevich who made it clear from the way he talked and moved that he did not possess the ability to survive his family’s change of financial circumstances. Charlotta, the drama-queen governess had the good fortune to be portrayed by Tatiana Shestakova who kept her comic shtick believable while Sergei Kuryshev as the trusted manservant Firs, who opens and closes the play with his dithering monologues, was heartbreaking as a man totally done in by the estate’s dismemberment. He is, perhaps, the only truly tragic figure, a man at the end of his life, wearing a dated uniform, done in by fate. The rest of the cast—Oleg Ryazantsev as an ardent student; Andrei Kondratiev as the dutiful and put-upon estate clerk; Arina Von Ribben as a lusty housemaid; and Stanislav Nikolskii and an equally ardent young manservant—were terrific, too. The costume designs, uncredited, were low-key and period perfect and the lighting by Damir Ismagilov made the most of the actors’ dashes through the Harvey. The Cherry Orchard is always worth a revisit and the Maly Drama Theatre’s production gives ardent life to these characters. Modern dance and classical ballet shared the stage in the final program of Fall for Dance 2017. Director Doug Hughes has surrounded her with an excellent cast all attuned to the nuances of the drawing room comedy, a fading art.